I put on a bit of weight last year. I blame living in Wisconsin and starting a new business for this unfortunate change. 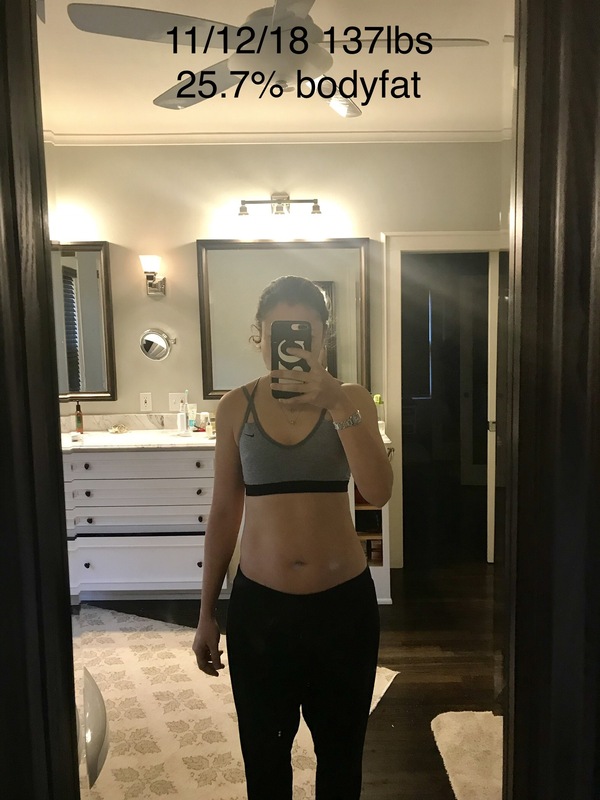 I’ve always hovered at 128-130lbs, but this fall, in spite of my workout regimen, normal thyroid levels, and healthy eating, I weighed 138lbs and I didn’t like it. I’d been hearing a lot about the ketogenic diet and decided to give it a shot. Keto is all the rage these days for a host of reasons – rapid weight loss, disease prevention, longevity, to name a few. Simply put, the ketogenic diet is a high fat, moderate protein, and very low carbohydrate diet, where the goal is for the body to burn fat (or ketones) as it’s primary source of fuel as opposed to glucose (or carbohydrates). It’s different from other diets in that you can tell if you’re in the metabolic state of ketosis by measuring by the level of ketones in your blood. I broke out the food scale, signed up for a premium account on the MyFitnessPal app, and began tracking. 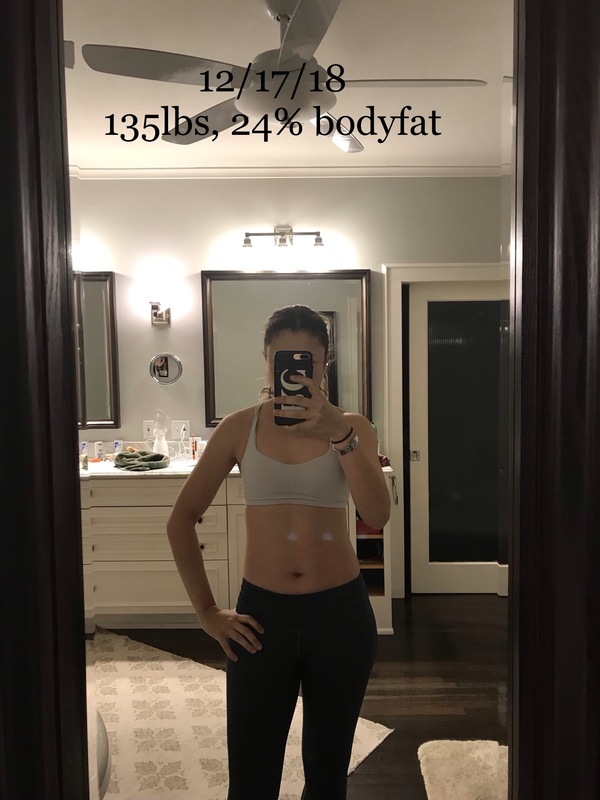 This journey commenced with me at 138lbs, 27.4% body fat (this is the device I use – I’m not sure how accurate it is, so I rely more on the trendline than the actual measurement). I was constantly hungry and could think of nothing but food. I always carried something keto-friendly to eat and allowed myself to eat when I felt hungry, even if it meant going over my daily calorie goal. 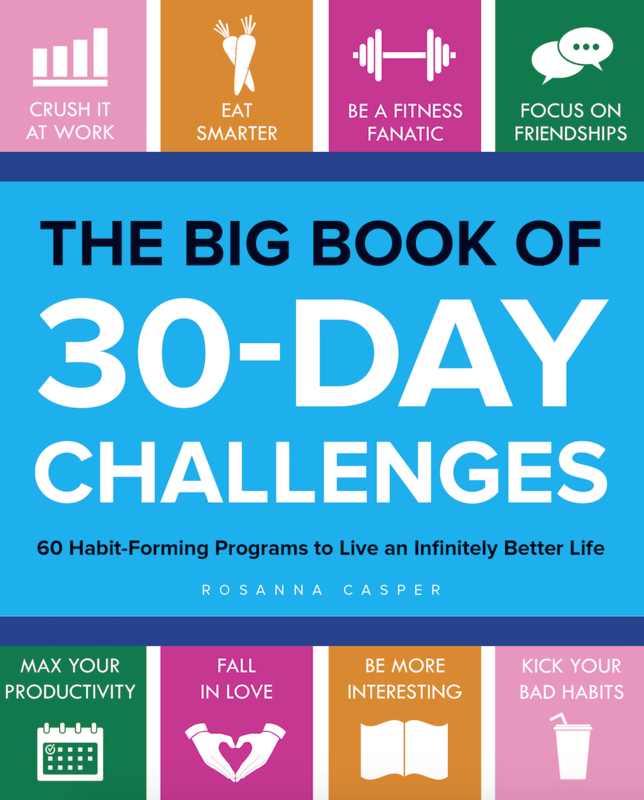 One pound down – mostly fat too! 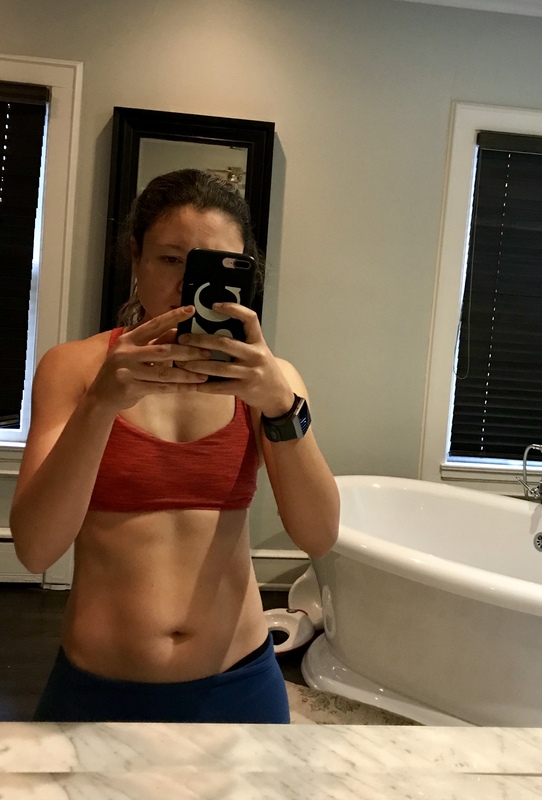 I got the “keto flu” (aka carb withdrawals) and it was bad. My body burned through its last stores of glucose (its preferred source of energy) and since I wasn’t giving it any more carbs to burn, it began to frantically search for a way to burn its backup energy source for fuel: fat. I suffered from some serious headaches and dizziness for a few days and had to supplement with electrolytes. Thanksgiving. Family flew in for three days of food and fun. I ate well during the day but caved on the first night, and everything went downhill from there. It wasn’t pretty. Photo taken before the Thanksgiving madness. As you can see, I gained the weight back after Thanksgiving – plus half a pound. Sigh. At least my bodyfat dropped. In spite of my Thanksgiving transgressions, I got back to work. I stopped feeling hungry all the time and found that fewer calories satiated me (a huge benefit of keto). Save for two cheat nights, I stuck to the diet with near perfect adherence and I loved the results. However, I never measured my blood ketone level to see whether or not I was in ketosis. My clothes fit a little looser, my arms and abs look more defined, and I felt significantly stronger in the gym. I took this picture on December 23rd, weighing in at 133lbs and 23.8% body fat. I couldn’t believe the definition and I felt so proud of myself. And then, I hopped on a plane to California for Christmas. I had every intention of staying ketogenic during our two week trip out west, but it was the holidays, we were out of our routine, and I am only human. I indulged, but took a different approach than I did over Thanksgiving. This time, I continued to track my meals so that I would have a sense of where my calories came from. Knowing that I’d have to log my food intake allowed me to make better food and exercise decisions. So while I did eat pasta and pie, I never said “screw it” and binged. And when I got home two weeks later, I weighed in at 134lbs. 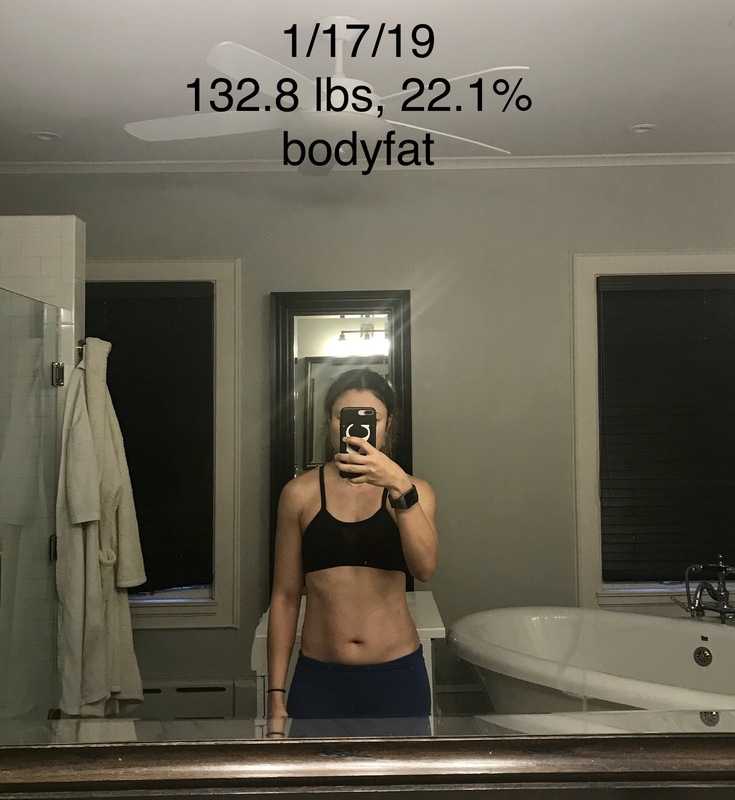 If I stuck to the keto diet 95% of the time but veered off track a bunch, can I really say I was ketogenic? Can you be on a diet if you cycle off of it on a regular basis? This is the problem I have with diets. 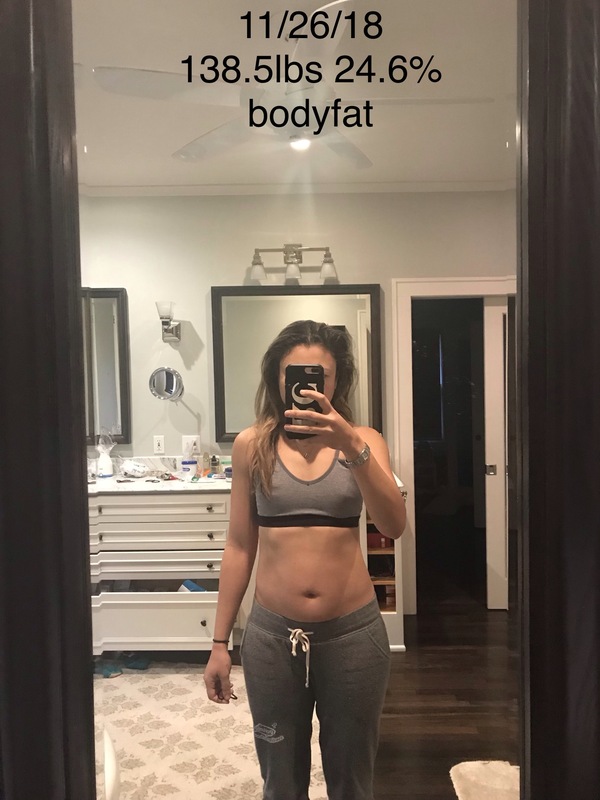 I eat well for a period of time, see results, and feel incredible. And then something happens – the end of the challenge, a party, stress, Thanksgiving – and just like that, all of my hard work has gone out the window. I view calories and macronutrients like a daily budget. I have a certain amount to spend each day. No food is off limits. HOORAY! However, in order to hit the above targets, my diet has to be pretty nutrient dense, not calorically dense. No bingeing allowed. Some apple pie is okay. Two slices of pie with ice cream and chocolate sauce is not. Track, adjust, track, adjust, rinse, and repeat. Yes, this means that I must log, weigh, and measure everything. To many, this might sound tedious and anxiety-inducing, but I geek out on this stuff. Weight and body fat dropped even with increased caloric and carbohydrate intake. 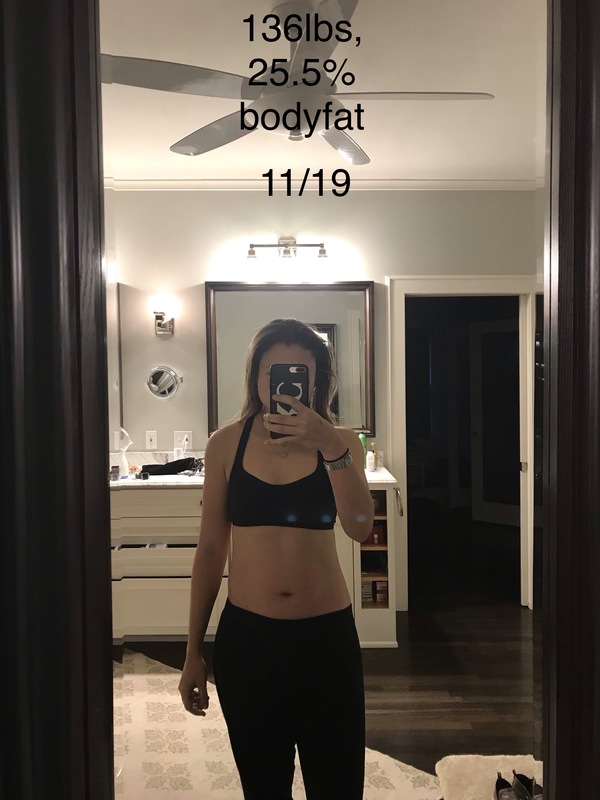 I weighed in at 131.8lbs, 20.6% body fat. In the end, I lost 6lbs, lost 10.6lbs of fat, gained 4.6lbs of lean muscle mass in the 12 weeks that I’ve been on this journey. 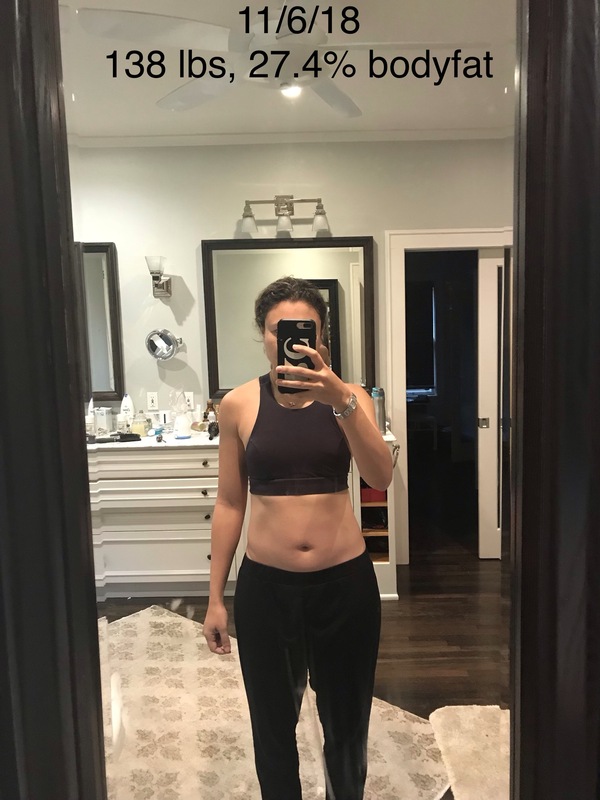 The first seven weeks I ate according to the ketogenic diet but cheated repeatedly. During the second half, I gave myself more flexibility but always stayed under (or at maintenance) my calorie goal. I never binged once, and I’m still going strong. More to come on this adventure!